Batala Bristol was started by the bands Musical Director James Soulson in 2011 when he moved to Bristol after playing in Batala Mersey. Since then Batala Bristol has grown continuously. With many of the original members of the band still playing and new players joining every year, the Bristol Batala Family now numbers 50+! 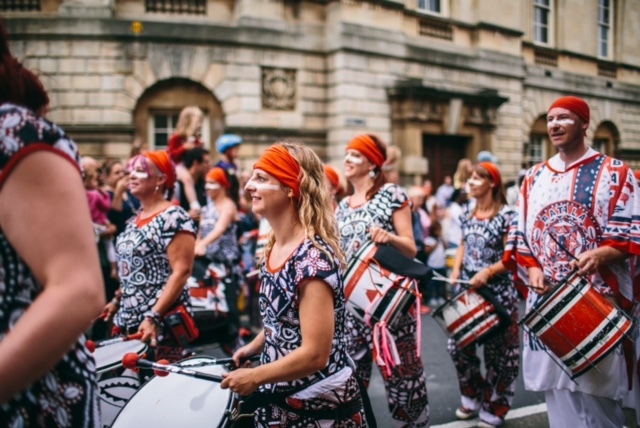 Batala Bristol is a non-profit organisation, run entirely by volunteers, with drummers of all backgrounds, nationalities and ages. Dobra is the the mid-range sound, the melody drum. This smaller version of the Surdo, played with two beaters, is unique to samba-reggae. The Repique is played with two flexi sticks, this drum helps call in the breaks and provides a “double layer” of clave to add to the snare.